The budget of part-time work and a graduate school stipend does not allow for many of life’s luxuries, including an extended vacation. Nevertheless, my husband and I determined to get away even if it was just for a night. After finding a special discount at a charming-looking inn, we made our way to Sheboygan Falls. We encountered many raised eyebrows when we told people we were doing an overnight trip to Sheboygan Falls just to get away – it is a small town with admittedly little to do in the immediate vicinity. And it was just what we needed. We stayed at the Rochester Inn, where each room is actually a two-story suite, composed of a lower-level sitting room and an upstairs bedroom. Of course, the bathroom was outfitted with a lovely soaker tub, a reminder of the nearby Kohler factory. The innkeeper was very friendly, the rooms as charming as we had hoped for, and having breakfast delivered to us at the time of our choosing truly made it a relaxing stay. We spent our first morning at Kohler Andrae State Park, one of our favorite Wisconsin parks. 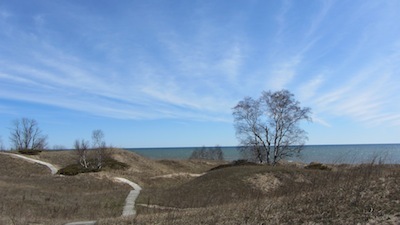 We walked along the cordwalk lining the dunes, taking in Lake Michigan’s sparkle and strong breeze, picnicked at one of the beach tables, and hiked through the woods. After checking in to the inn, we walked around Sheboygan Falls, which satisfied our wanderings with its quaint downtown. The falls themselves are picturesque. We browsed shops, our favorite being Evans Variety Store with the most incredible selection of boardgames that I have ever seen. To our delight we found domino trays designed for Mexican Train dominoes, a family favorite. We ate dinner at Firehouse Pizza, so called for its location in an old firehouse. Delicious thin-crust pizza and chicken parmesan, cherry pie, and a great atmosphere. The following day after our in-room breakfast we headed to another Sheboygan gem, the John Michael Kohler Arts Center. Some of the exhibits were in transition, but the ones we saw were captivating, and since the museum is free, the roped off spaces didn’t bother us! We then debated going into Milwaukee, which would have been easy enough to do. But we opted (or perhaps I should say my sweet husband indulged my wishes) to do some baby errands, instead, looking at furniture and strollers and car seats and the like. We ended the day back in Madison with dinner at one of our all-time favorites, Brasserie V. Best moules et frites in town. And an awesome beer selection (not that I’m able to partake of that these days). As mini as our vacation was, it still felt like a vacation. Even though everything we did could have been done during a day trip. We both felt relaxed and refreshed. And we were still happy to return home. LaFevers, Robin. Grave Mercy. His Fair Assassin. Book 1. New York: Houghton Mifflin Harcourt, 2012. Plot: After Ismae Rienne’s childhood in the household of an abusive, turnip-growing father culminates in his sale of her to an equally abusive husband, she gladly takes an offer of refuge at a convent dedicated to St. Mortain, the god of Death. There she learns that her true father is St. Mortain, Himself, indicated by a nasty scar on her back brewed by the poison her mother took to try and expel Ismae from her womb. Ismae embraces her new role at the convent where she joins Death’s handmaidens in dedicating her life to the god and His desired assassinations. After completing her training in weaponry, poisons, history, politics, womanly arts, and her first two assignments, Ismae unwillingly enters into her next assignment posing as the mistress of Gavriel Duval in the court of Brittany’s young duchess, Anne. Her abilities to spy on Duval and identify any treachery on his part are thwarted by her growing affection for the man. With France and other parties threatening Brittany’s independence and future, time is running short for Ismae to collect herself and carry out her assignment. But as she begins to question her obligations to the convent, she wonders whether she has landed on the right side of good and evil. Literary Quality: LaFevers’ first entry in a planned trilogy grabs readers from the start and does not release them until the very last page. The blend of history, politics, mystery, fantasy, and romance along with well-paced chapters are sure to engage a wide variety of readers. Grave Mercy explores questions surrounding death, religion, gender expectations, love, and duty thoughtfully and with dark humor, but does not answer them completely (unsurprising given the additional novels to follow). LaFevers’ dynamic characters are most human in their combination of endearing and infuriating traits and moments. Ismae’s evolution and concerns over her self-identity nicely parallel the fears and transitions surrounding the fate of the young duchess and Brittany’s independence without being overdrawn. At the same time, readers will find it difficult to feel settled in this startling and provocative suggestion that in a strictly gendered world, women find power and agency in life through death. Cultural Authenticity: LaFevers elegantly combines both real history and a fictional past in Grave Mercy. She also takes inspiration from mythology and epics. She has explained this process a bit in an interview at The Enchanted Inkpot noting that the most difficult part was paring down the political intrigue, which was even thicker in real life than in the book! Of course, the book coud be further enriched by a list of sources, but LaFevers’ website does offer further information and a select bibliography, as well as explanations on her creation of this fictionalized historic world. Audience: I would recommend this book for readers ages 15 and up. As mentioned above, the blend of genres and topics should have wide appeal. 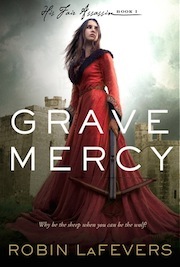 Personal reaction: Grave Mercy combines some of my favorite things to read (medieval European history, strong female protagonists, mystery, and romance) so well, I just couldn’t put it down. I did have some lingering questions about the outcome of the story that I expect will be answered in the rest of the trilogy. I felt particularly satisfied that I was never certain of the traitor’s identity until very near the end; new questions and doubts always popped up. I look forward to the next book!